Time and Attendance and Time Clock systems from Central Time Clock Company are used by companies of all sizes to record working hours of employees in order to properly pay their wages. Central Time Clock supplies and services the latest technology in the time and attendance industry. Our systems include: Infotronics, Attendance Enterprise, Amano MJR7000, CP5000, Compumatic Facial Recognition, Lathem, Acroprint, Recognition Systems, the Mfg. 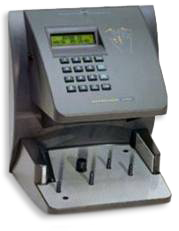 of the Biometric Hand punch 1000, Hand punch 2000, Hand punch 3000 and Hand punch 4000. Companies that employ hourly workers have a requirement to record the number of hours worked with overtime, lunch and time off rules. Time & Attendance Systems such as Infotronics Attendance Enterprise have all the company policies and labor rules programmed into them to keep accurate track of labor costs. Time & attendance systems enable your payroll department to have full control of all employees working hours right at their fingertips. It is also extremely valuable for ensuring compliance with labor and HR regulations companies with a large number of employees. It is an essential component necessary for large companies to install several time clock units in order to speed up the process of getting all employees to clock in or out quickly or to record activity in dispersed locations. 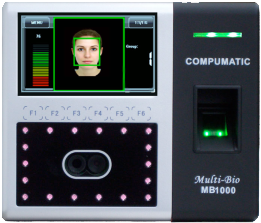 Depending on hardware such as Badge Systems or Biometric Identification Methods such as Hand Recognition, Facial Recognition as seen above or Fingerprint Readers and number of Time Clocks required. Central Time Clock has been meeting the needs of large and small companies for 27 years and have prices to meet any budget. A Time & Attendance System protects a company from payroll errors and fraud and provides both employer and employees with confidence in the accuracy of their wage payments.